I planned a full day trip for Sunday to visit Mysore. We left the hotel a little after 6:30 in the morning to get a head start. Mysore is the second largest city in the state of Karnataka after Bangalore. It is located at the base of the Chamundi Hills about 146 km (91 mi) southwest of the state capital Bangalore with population of more than 880,000. Our fist stop is the Jamia Masjid, a mosque in Srinagar, in the middle of the old city. We didn’t go inside the mosque but only walked around and outside. Our next stop was The Ranganatha Swamy Temple. The temple has fort like walls and an intricately carved Gopura in Vijayanagar style of architecture, a mixture of the Hoysala and Vijayanagar styles. The main entrance has Chaturvimsati (four) pillars has the cravings of the 24 forms of Vishnu. Then we visited the St. Philomena’s Church, a Roman Catholic Church built in AD 1840. The twin towers of the church stand at 175 feet in a gothic design with stained glass windows. Next stop was the Chamundi Hills. The hill is 3,489 ft above sea levels and is only 12 km from Mysore city center. The drive up the hill was fun with lots of turns and our driver was going fast with confidence (I had the seatbelt on). On top of the hill, there are great views of the city below. 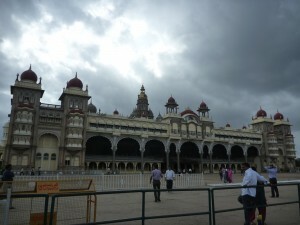 The last stop and highlight of the trip is the Mysore palace, the Maharaja’s Palace. The palace was designed by an English Architect named Henry Irwin and it was surprising only built between 1897-1912. It was a huge palace and a very grand one. I can only imagine what it was like living in it. Unfortunately no picture is allowed inside the palace but I did take this picture from the outside with the big cloud on the sky. Soon after this picture, the sky opened up and downpour the rain. The way home was a long drive with traffic not moving. We left the Palace around 5:30 and didn’t get back to the hotel until past 11. We were so hungary and tired that we needed to stop for a quick late night snack at A2B, a very popular restaurant chain that serves very affordable and good south indian food. My first meal in a local Indian restaurant that’s not in a hotel and I really enjoyed.